There is something magical about the first big snow storm of the season. I don’t know if it is the fact that it has been 8 months since seeing everything blanketed in fresh white fluffy powder or the fact that it came the week before Christmas. Whatever the reason, for me it takes me back to being a kid and getting so excited every time it snowed. At the first sign of falling flakes, I loved to go out and play in the snow, go sledding, ice skating and of course pray for snow days off of school! As we become adults, sometimes we lose the magic and joy we once had as kids….about so many different things. So with that in mind, I decided that I was going to go out and build a snowman. My husband thought I was nuts! He said, “What are you doing, it is freezing out there.” But I didn’t listen to him. I went out anyway, and guess what…I had so much fun! I had forgot how much fun winter could be. I could see that for years I had been missing the fun of winter because I was caught up in the adult responsibilities of what too much snow usually means – and none of those thoughts filled me with joy. When I let myself really SEE what was right in front of me, my whole viewpoint changed. So, if you are lucky enough to live somewhere that gives you a front row seat to Mother Nature’s amazing winter carnival of fun – go out and enjoy it. 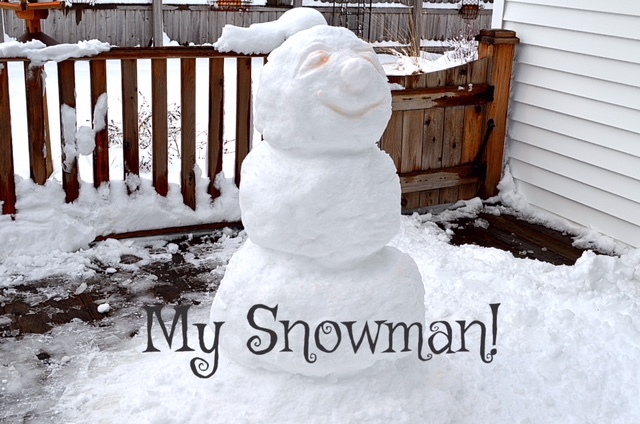 Recapture the joy and delight of your childhood, after all, winter fun isn’t just for kids!